Ah! Nothing like a lazy day at the beach! 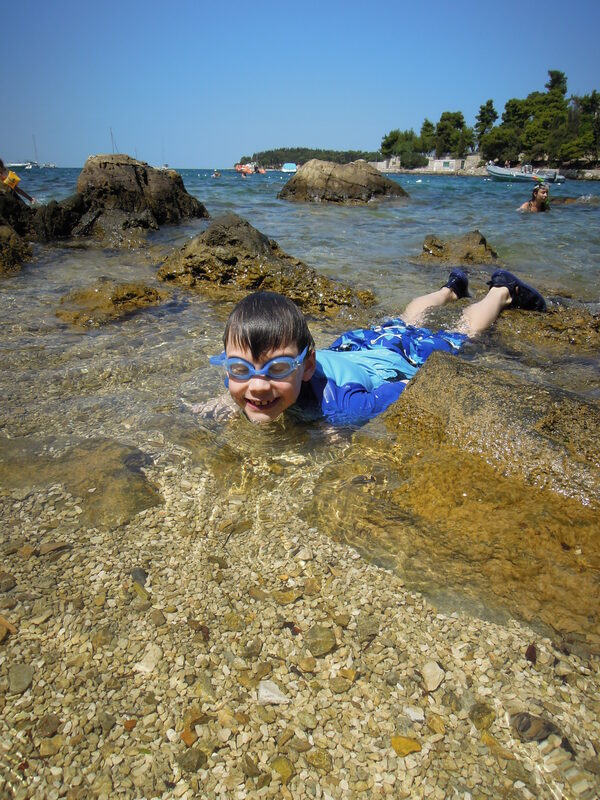 However, we needed to learn the hard way not to be too ambitious in the heat in Rovinj. Our flat came with a family pack of bikes and naturally we wanted to use them the first day. Quentin’s tires were flat, so the first order of business was to find a gas station. On the way, we also discovered that his seat was just slightly too high. As soon as he realized that he couldn’t touch the ground with both of his feet at the same time, he went into fight and flight mode…screaming with panic every time he anticipated a stop. 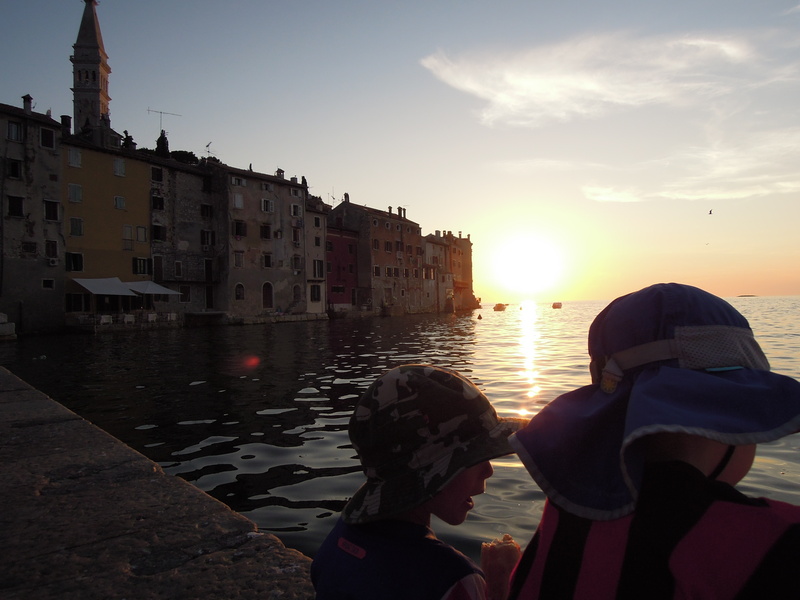 We needed to find a wrench fast, and so began our epic heat walk…towing bikes and exhausted, stressed-out kids all over Rovinj. We eventually found a friendly soul willing to lend us a wrench and we eventually squeezed in a swim (the purpose of our outing), but we never did make it back on the bikes. Quentin’s tires wouldn’t stay…flated? (Stephen has just informed me that the opposite of deflated is INflated…how did I manage to forget that??) The bikes ended up being eight wheels of heavy, awkward burden uphill in the blazing heat. Needless to say, we ditched the accursed bikes. It was a long, grumpy day…and I had my first feelings of wishing I were at home instead of in a beautiful Istrian town on the Adriatic. Today, we got it just right. We were up bright and early, strolled down to the beach (a mere 20 minute walk on foot), chose the best spot and just hung out. The kids snorkeled and explored, standing up every couple of minutes to excitedly proclaim a new fish discovery. I trailed them with hats and sunscreen, ready to slap some on whenever they surfaced. The water was blue blue, Rovinj was pretty as a picture, and my mood was sunshiny all the live-long day. All food was good and easy to find, complete with good service, shady ocean-side tables and beautiful views. Sorry home…you can wait a little longer. By the way, the day continued to be a winner right up until the end. We decided to grab a couple of cheap sandwiches in the old town and sat munching them with our feet dangling over the water as the sun set. After some ice cream and a couple of cocktails, we headed on home, happy and knowing exactly how we will spend the next few days here in Rovinj!